El Cubano Gordo & Friends: Week 1 is officially in the books. Be afraid my fellow Gordo's. The Weight Loss Journey of Friends Who love Fried Plantains and Picadillo. Week 1 is officially in the books. Be afraid my fellow Gordo's. As many of you know I have unfortunately won this competition way to much. And like many of you I struggle with the yo yo of weight. I am not going to lie, I LOVE FOOD!!! But as I get older and reflect, I realize that my health needs to be a priority compared to my mouth. So I wish you all good luck. I had a really great first week, but it could have been better. I hope a lot of you (Tom) can start posting and talking trash, trust me it definitely motivates me. 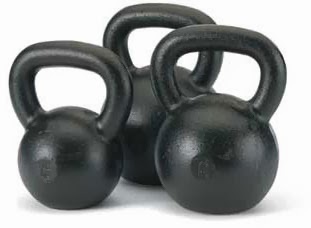 I have fallen in love with a new piece of workout equipment for this competition, the kettlebell. Hopefully it puts me over the top and I can capture an unprecedented 4th El Cubano Gordo title. NICE. need to get me a kettle bell. I have done some rough math and found that I can only win this through an unhealthy level of aggressive weight loss. Which is fitting considering the unhealthy ness of my original weight gain. What is El Cubano Gordo? We're a group of friends trying to lose some of the added pounds we've accumulated over the past year. This isn't the first time weight has crept up on us. In 2007 we began a four-month-long competition to see who would be the first to lose their spare tire. In 2008 we followed it up with a second contest that included a triathlon. It's 2010, a new year and fresh holiday pounds to lose. Who Won the 1st Contest? Who Won the 2nd Contest? Who Won the 3rd Contest? How many calories in a Magnolia Cupcake? Week 8 results are in. Only about 4.5 weeks left.….. Does This Holocaust Memorial Make My Arms Look Fat?